As summer approaches one of the many changes that occur in nature is the emergence of wild mushrooms. 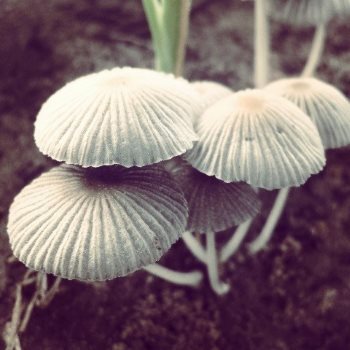 The term “wild”, referring to mushrooms that have not been cultivated and have grown naturally. 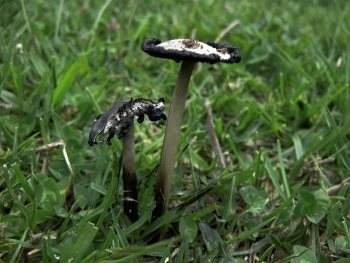 One would expect to only find wild mushrooms in the” wild” as their literal name suggests, however they can pop up also most everywhere, even on grassy lawns in suburbia. 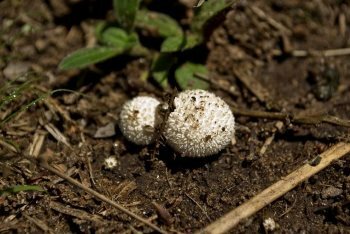 While the majority of mushrooms found in South Africa are not poisonous, the few that are have resulted in many fatalities over the years. The consequences of eating the wrong wild mushroom range from dizziness to severe diarrhea and even death. A mushroom is the fleshy fruit bodies of several species of macrofungi (fungi which bear fruiting structures that are large enough to be seen with the naked eye). It is eaten like a vegetable, yet the part we eat is called a “fruiting body”, is neither a fruit nor a vegetable They can appear either below ground (hypogeous) or above ground (epigeous) where they may be picked by hand. Edibility may be defined by criteria that include absence of poisonous effects on humans and desirable taste and aroma. Mushroom poisoning (also known as mycetism) refers to harmful effects from the ingestion of toxic substances present in a mushroom. These symptoms can vary from slight gastrointestinal discomfort to death. Mushroom poisoning is usually the result of ingestion of wild mushrooms after misidentification of a toxic mushroom as an edible species. The most common reason for this misidentification is close resemblance in terms of colour and general morphology of the toxic mushrooms species with edible species. As EMS we have often treated entire families, who have ingested poisonous mushrooms that were used in a meal. Mushrooms may also cause an anaphylactic or allergic reaction, where the body reacts to allergens present in the mushrooms which can trigger an allergic reaction. In some instances mushrooms can also cause food poisoning. Many field guides on mushrooms are available, but the ability to identify and prepare edible mushrooms is often passed down through generations. 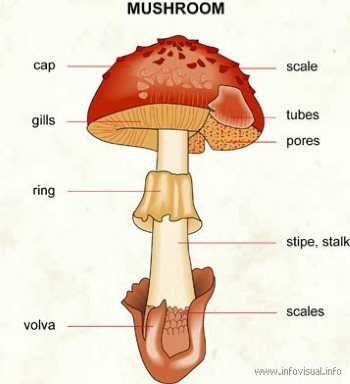 The below picture shows the different parts of a mushroom, which are used to help identify a species of mushroom. ”LBM “ found In a back yard garden. "Big white mushroom" (or BWM) is also sometimes used to describe groups of difficult to identify larger mushrooms. The main attraction of mushrooms and the reason they are eaten is for their culinary value. Before assuming that any wild mushroom is edible, it should be identified. Proper identification of a species is the only safe way to ensure edibility. Deadly poisonous mushrooms that are frequently confused with edible mushrooms and responsible for many fatal poisonings. Medicinal mushrooms are mushrooms or extracts from mushrooms that are thought to be treatments for diseases, yet remain unconfirmed in mainstream science and medicine, and so are not approved as drugs or medical treatments. Such use of mushrooms therefore falls into the domain of traditional medicine. 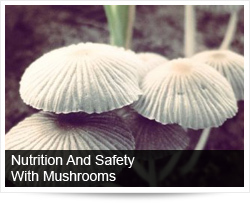 Only a few mushroom extracts have been tested for potential efficacy. Preliminary research results for most other extracts are on isolated cell lines, animal research with rodents, or early-stage clinical human trials as pilot studies. Only eat mushrooms you have positively identified yourself or by a mushroom expert. Identify mushrooms a second time during preparation and cook them properly, unless you know that the species can be eaten raw. Do not combine mushroom types. Inform yourself about deadly mushrooms and those that are look-alikes of edible ones. "Deadly twins" differ regionally, so take into account regional variation. Do not gather mushrooms that are difficult to identify, unless you have expert knowledge. This applies especially to the "little brown mushrooms" discussed earlier. Consume only a small amount the first time you try a new species.  People react differently to different mushrooms, and all mushroom species can cause an adverse reaction in a few individuals. 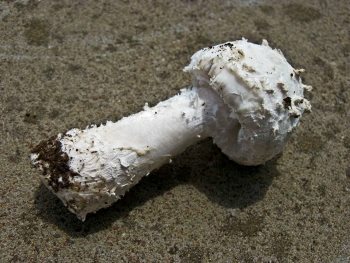 To make the situation worse regarding the potential dangers of mushrooms, especially mushrooms that have grown in farm lands are often inadvertently sprayed with and or absorb chemicals and pesticides intended for crops and the pesticide residue can be instead, by humans from the mushrooms, which can result in illness. Humans have been eating mushrooms for hundreds of years and hence there are many myths about mushrooms and which are safe to eat. These same myths are a cause of many poisonings as relying on myths to help identify poisonous mushrooms is a dangerous strategy, as many of these myths are inaccurate and have no scientific basis. Insects can tell which mushrooms are poisonous and will avoid them. Not true! So unless you’re absolutely sure of the mushroom you have identified to eat, do not eat it, remember even experienced mushroom hunters have poisoned themselves. If you are going to eat wild mushrooms be absolutely certain of the type of mushroom you are eating, it cannot be over emphasised enough. Base this decision on your knowledge of mushrooms and not on what folk law and myth say is safe to eat. Mushrooms which are in fact a fungus have fleshy bodies, most of which can be safely consumed if correctly identified and prepared. The main attraction of mushrooms is for their culinary value, despite having little proven nutritional value. Some species of mushroom have toxins which can cause side effects ranging from gastrointestinal cramps to death. The most common reason of ingesting poisons mushrooms is the persons like of knowledge about mushrooms or inability to correctly distinguish the species of mushroom, which in the case of certain species require a person with expert knowledge and a microscope.